I saw 7Thvrsday perform L’arc En Ciel and Do As Infinity hits during the 2007 Nihongo Fiesta. The performance was good but the sound system sucked. I really wanted to throttle the people in the control booth every time the microphone buzzed. The acoustics of the venue also contributed to the problem. Clam Shell II is definitely not conducive to acoustic music performances. Nevertheless, the band continued with their set as if nothing annoying was going on. Brava, 7Thvrsday! Brava! 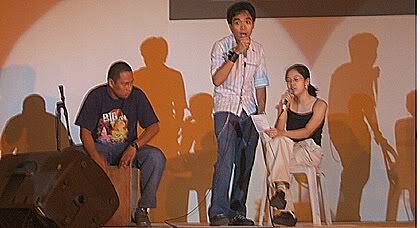 7Thvrsday on stage at the 2007 Nihongo Fiesta. The boys with feature female vocalist, Kim-ja Aban. 7Thvrsday is Filipino band formed September 2002 from a group of friends who had a common taste for Japanese rock music, or J-rock as it is more commonly known. Their diverse musical background reflects in their original compositions. The complex mix of their influences gives rise to heavy but melodious rock music, with lyrics that ring of positive messages. Currently, the band is starting to record more songs to complete their first album.